The Clock Repair Specialist offers a personal, qualified, experienced, and secure service for all aspects of clock repair, servicing, and clock restoration. It specializes in high-grade quality European and American clocks such as French carriage, long case, grandfather, bracket, regulator, and ATMOS clocks, including electrical and modern timepieces. House calls can be scheduled for servicing, moving, delivery, or setting up clocks. Importantly, complete overhauls and restorations are guaranteed for 12 months. Also, cost estimates, approximate length of time for repair, and a detailed invoice on all work is provided. 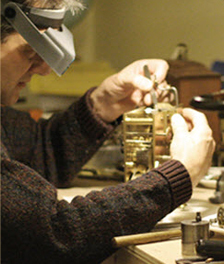 What sets The Clock Repair Specialist apart from others is the proper training and certification he obtained from the British Horological Institute on watch and clock repair. Furthermore, the 27 years of experience in working with clocks carried a big advantage in refining the efficiency of performing clock repair in Denver, including the skills, dexterity, and craftsmanship of The Clock Repair Specialist. As a conservationist, The Clock Repair Specialist provides customers the in-depth value and history of their clocks. This skill comes hand in hand with the competence of knowing whether the clock dial, case, and mechanism are original to the clock. With our personal, professional, experienced, service to every customer, our relationship does not end when a job is done. Because of the high importance of maintenance to ensure smooth and accurate operation of timepieces, we notify our customers. We offer reminders to our customers when their clocks are due for servicing. This allows us to effectively assess any need for antique clock repairs. British trained Horotoligist, Graham Daykin, has over 27 years of experience repairing, restoring and overhauling antique and modern clocks. Recent Projects - Click the images to view at full size and see more details. Copyright 2011 The Clock Repair Specialist: Clock Repair Denver. All Rights Reserved.